My kitchen is a party right now! Aromas and smiles all over….It is picanha day! What are we celebrating? You. That’s right! Because of you, my dear reader, we are eating one of the most naughtylicious (if you permit me) cuts of meat: picanha or top sirloin cap for dinner. Although you are not physically present, you are in my mind…. In Brazil, the top sirloin cap (culotte or coulotte) — called picanha (pronounced pee-KAHN-yah)– is served traditionally grilled over the open flames. It is one of the most popular cuts of meat served in the churrascarias or Brazilian Steakhouses. Alternatively, picanha can be cut into thick slices, seasoned with only coarse sea salt, and then grilled with the fat layer facing up until most of it melts away, and the remaining fat becomes crispy. You can also roast the picanha in the oven — as I did (modern approach). But before we get there, I would just like to reinforce that when you go shopping for the meat, make clear that you are looking for the top sirloin cap (Culotte, Coulotte, or Picanha in Brazil), not the top sirloin. Those are two separate cuts from the sirloin, but referred to by a similar name. Picanha is also commonly confused with tri-tip (a cut of beef from the bottom sirloin primal cut, known in Brazil as maminha). Outside of Brazil or Argentina, it may be a challenge to find picanha for separate purchase, as butchers might then encounter difficulty selling the remaining cut of meat that is left over. Picanha is often sold together with the whole top sirloin, and in this case it is the upper muscle layer, which is covered on top with a layer of fat. I would suggest first asking one’s butcher for the right cut, but otherwise one may need to purchase the whole top sirloin and pay for the leftover, which can be separated from the picanha and used to make something else, if desired. Now, let’s cook together. Excited? Let refrigerated meat rest at room temperature for about one hour before cooking. Preheat oven to 480 F (about 250º C). Mix the garlic powder and all the dried herbs with the coarse salt (plus the red pepper flakes, if desired). Reserve. Place double aluminum paper in a baking pan, lifting the sides. Make a layer with 1/2 of the salt and place the picanha on top of this with the fat facing down. Then, cover the picanha (top and sides) with the other half of the salt. In Brazil, it is common to eat the partially melted, crunchy fat of the picanha. If you don’t intend to eat this portion, you can place the meat in the pan facing up. Roast uncovered until a meat thermomether inserted in the thickest part of the meat (center) reads 120°F to 125°F, (49°C to 52°C) for rare, 130°F to 140°F (55°C to 60°C) for medium rare, 145°F to 150°F (63°C to 66°C) for medium, and 155°F to 165°F (68°C to 74°C) for well done (Note: 120° is a pretty rare roast). It may take at least 30 minutes for rare in the oven. Before slicing, let cool down on a rack for at least 15 – 20 minutes and also remove all the salt crust. Serve with lime wedges on the side to squeeze over the picanha. Preheat the oven to 400 F (about 205º C). In a large bowl, mix all the ingredients. Reserve. 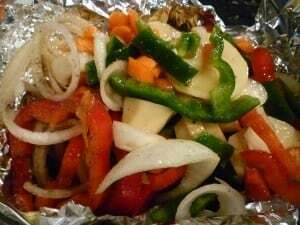 Place a double layer of aluminum foil (large sheets) in a glass baking pan and pour in the mixed vegetables. Fold and crimp all the sides shut, forming a pouch. Bake for 60 – 70 minutes or until potatoes are fully cooked. Serve as a side for the picanha. Image of Picanha on the skewer from Baker Street School. This recipe is not very authentic. In Brasil we do not season picanha with anything other than coarse salt. To mask the flavor with any other spice would be considered a travesty where I am from. I would suggest that if this is someone’s first time trying picanha, they absolutely should not try to add anything other than salt to the meat. When I place a recipe that it is not traditional or that I have added extra ingredients, I inform my public which many other sources (most important ones) don’t care to do it. If the public do not read my articles, it is not my problem anymore but theirs. I would also suggest that before leaving this type of comment, you do read my articles. You have a great day! Delicious recipe and outstanding explanation on how to actually buy the Picanha! I was really curious about the way to find picanha in Uncle Sam’s lands! Hi, Fábio!!! Welcome to From Brazil To You. Thanks a lot. I am glad this post was useful to you and you enjoyed this recipe — which is a family favorite. This dish is something that I can prepared all year round in the oven and adding more seasonings than the traditional salt only… Definitely, a modern approach to the grilled picanha that for me it is better to prepare in the summer. Enjoy and have a great week! I’m a chef with a Brazilian wife and have travelled to and around Brazil several times. I just thought it was worth mentioning that Picanha is actually the cap from a beef rump and not the Sirloin. I’m trying to be helpful not critical. The rump cap has better flavour, and in most countries outside of Brazil you can pick it up for less than half the price of a Sirloin. In my home country, picanha is usually grilled — although there are some home cooked recipes (as the one that I featured here) that prepares picanha in the oven… This way, this cut of beef, so popular in Brazil, can be enjoyed all year round despite of the weather. It seems we’re both talking about the same cut of beef but we use different terms in English. I have found very good quality picanha in most AJ Seabra Supermarkets in NJ and Rhode Island. It’s true that picanha can be easily be made in the oven at 400-450. Dredging the meat through Kosher Salt before cooking works great. Better to remove the fat if cooking in the oven to avoid smoke. Care must be taken with watching the temperature because it is a thin cut and temperature rises quickly. I use a remote thermometer to monitor the process to ensure I can pull the meat out a the right time. I prefer it pulling it out at 138-140 F.
You mention removing the salt crust before serving, but in the photo it looks like the salt crust was left on for serving. I am also confused on whether the fat cap should be on top or bottom for cooking. I would love to try this recipe, but would like those clarifications first. Hi Kevin! Thanks for stopping by. I left the coarse salt on top for food styling purpose ONLY — it looks nice in photo! So please remove all the salt from the meat before eating otherwise you will find the taste unpleasant. About the meat fat, the recipe is clear when it states to cook the meat with the fat facing down if you intend to eat it with the meat (very common in Brazil). It will partially melt and get crunchy. So good! But if you intend to discard whatever fat is left after cooking, place the meat facing up into the pan and cook according to the instructions. In this latter case, the fat will mostly melt and baste the meat. Please read the recipe before cooking. Thanks and enjoy! I made this recipe for our New Year’s Day meal and it turned out beautifully. The meat was tender and delicious and the salt crust gave it tremendous flavor. One side note is that the roast took about twice as long in the oven as what was discussed in the recipe. 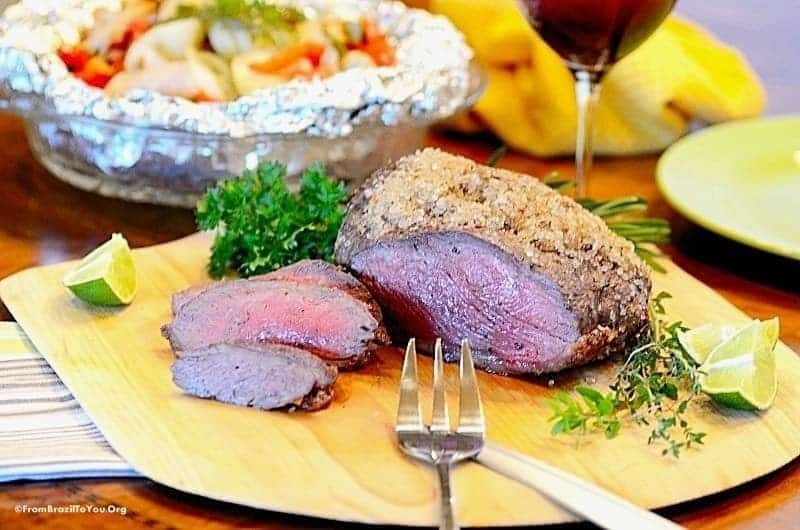 A meat thermometer is very important and useful tool in the kitchen and a key to the success to this recipe. I’d also suggest using a couple of egg whites in the salt to slightly hydrate the salt mixture so that it forms a cohesive crust. I found that the salt began to crumble especially along the edges when I was using the thermometer to probe the steak. Thank you for the recipe and I will definitely add it to my repertoire and make it again in the future. Hi, Paul! Happy New Year! Thank you for your feedback and also suggestion. I am glad you enjoyed the recipe. I didn’t state a total time for roasting because it depended on the desired level of doneness and also ovens variation. For rare, it would take “AT LEAST 30 minutes in the oven” according to the recipe. I left it for the thermometer to determine when meat was ready. Mine was rare and if I remember well it took for rare from 45-60 minutes to get ready! Thank you again. Wishing you an amazing 2019!